According to wikipedia, delayed gratification or deffered gratification is the ability to resist the temptation for an immediate reward and wait for a later reward. Generally, delayed gratification is associated with resisting a smaller but more immediate reward in order to receive a larger or more enduring reward later. With regards to savings, most people will probably say they cannot save as their income is not sufficient to have extra money. So saving for them will only happen in an uncertain future, when they have extra money for it. However, if you check on their lifestyle and spending habit as a financial adviser’s point of view, you can see that if they only have the will to save, they can do it. Savings is not proportionate to the amount of money you earn but rather the amount of money you save from your income. As we all know, expenses is directly proportional to the amount of income that we have. The higher it is, the higher our expenses as well. In short, if we want to save, let’s take a look at how we spend our money and look for ways to decrease expenses and increase savings. Delayed gratification plays a very important role on this part. Let’s take few examples to illustrate my point. I know most of you drink Starbucks coffee. Assuming per order is around Php 200 and you consume around 5 orders per month or even more. Instead of having this, you can change your habit and probably opt for a cheaper coffee. Or you can make your homemade one, knowing that doing this will increase your savings. By doing this, you’ll have around Php 1000 per month worth of savings. If you will invest that money in either mutual funds or stocks for at least 15 years with approximate 25% annual growth, it will be Php 1.6 M after 15 years. By this time, you can drink any starbucks coffee that you want even every day. How about buying latest phones and gadgets? Do you really need those stuff? Can you live without it? Let’s say you are buying the latest phone every year. Assuming the price is around Php 30000 pesos. If you will put that money in investment instead, at approximate 25% annual growth, you will have at least 4 million pesos. By this time, you can buy any gadget that you want or even more. How about your clothes, shoes, movie tickets, shopping, cars, restaurant dining and other expenses that you have? Can you eliminate or minimise at least, thinking that in 15 years the money that you can save is more that enough to provide you with that similar item or even more? Now let’s say you want to buy or build a house worth Php 5 million pesos. Since you don’t have the money, you loan it from the bank. See below computation. 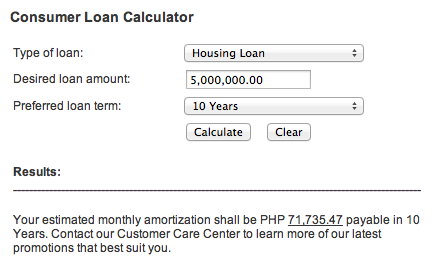 Your monthly amortisation will be Php 71, 735.47 and payable in 10 years. All in all, you will pay the bank a total of Php 8.6 million in 10 years, out of the 5 million you loan from them. Fast forward after 10 years, you are now fully paid with your housing loan. Unfortunately, all your savings also are used to pay your mortgages. In the end, after 10 years, you will go back home with no savings but with a Php 5 million worth of house. On the other hand, let’s try the other path with delayed gratification. I know you want to build a 5 million or even more worth of house. However, you found out that to best accomplish this, you will sacrifice for a while and invest the money for future. For 10 years, you keep on saving and investing Php 71,735.47 monthly in both mutual funds and stocks. Assuming the annual growth is 25%, after 10 years you will have Php 35.7 million pesos worth of assets. At this point, you decided to retire from your job and build your dream house worth Php 10 million pesos. 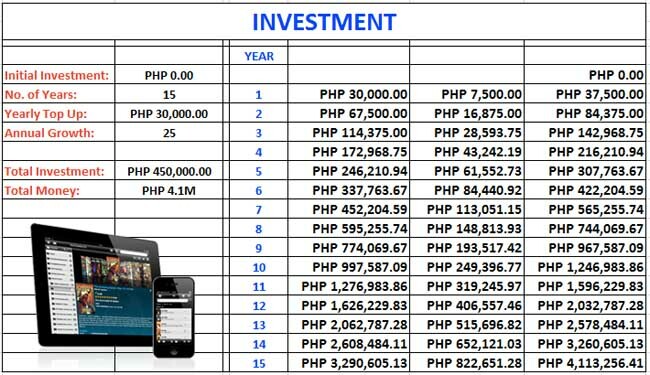 Out from your savings investment, you’ll still have Php 25.7 million which you will continue to invest. By keeping the principal amount and taking only the intesrest, you’ll get Php 6.4 million worth of money for your annual income. That’s more than Php 500K monthly allowance for your expenses. The good thing is, your principal money is still intact and keeps working for you for the rest of your life. I know there are lots of people who do not have savings. It is not easy to do as it requires a lot of discipline, self control and certain degree of sacrifices. However, the choice is always within us. Can you sacrifice today for tomorrow’s sake? If we can only follow delayed gratification, we will all be financially abundant in years to come. Next: Do You Think Putting Money in the Bank Makes You a Saver? hi ben. RISK is a part of investment. it’s only thru taking risk we can grow our money more. do you think your money in the bank is safe? what if they close down? but still we keep on putting money to the bank, at a loss because our money earns 0.3% annual interest rate compare to 4% inflation. there are 4 types of mutual funds: equity, balance, bond and money market. all of them have different RISK LEVEL. the higher the risk, the higher the returns. if you afraid of losing money, take the lowest risk instead. at least it will earn more than your current bank account. i choose to invest in equity, the highest risk. you need to know where they are investing the money. and so far, wala pang na bankrupt na mutual fund company. bakit? kase hindi sila yong nahawak ng pera, iniinvest rin nila sa philippine stocks…big stocks like globe, pldt, jollibee, metrobank and the rest. hindi lng isang company yong iniinvestan nila, madami. kaya kahit magsara man yong isang company don…..marami pang natitira. do you think globe will be close after 10 yrs? eh ang pldt? ang jollibee?